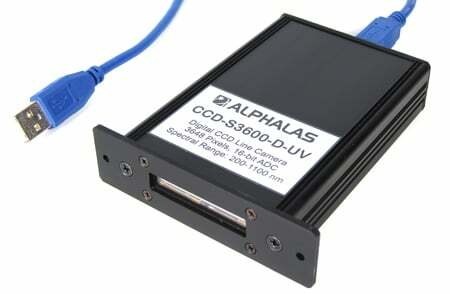 The CCD-S3600-D(-UV) is a complete and ready to use advanced high-speed digital CCD line scan camera. The device includes many unique features. At the same time it is easy to use, very compact, lightweight and does not require an external power supply. 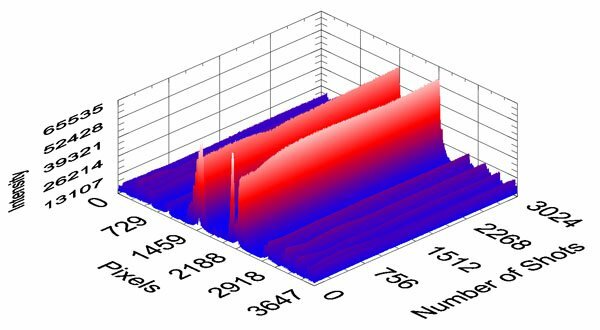 The high-sensitivity linear CCD sensor array contains 3648 active pixels and covers a wide spectral range. The sensor is controlled by complex fully FPGA-driven hardware. Other high-end components like 16-bit ADC, 32 MB DDR2 RAM & Hi-Speed USB assure high precision, large data storage & high speed. Highlights include high frame rates with no missing frames, precise control over parameters (e.g. integration time), trigger in & out, multiple operating modes and a unique data streaming mode. The CCD-S3600-D(-UV) is suitable for novice users who need to simply acquire light intensity data as well as advanced users and experts who want to "squeeze out" each of the advanced capabilities of the device. The CCD camera supports all major OS and can be interfaced from many programming languages, allowing unlimited post-processing possibilities. Acquisition & Viewer software, always up-to-date USB drivers, interfacing libraries and well-commented applications for LabVIEW and C++ are included free of charge. The CCD line camera represents an ideal cost-effective solution for numerous applications in science, research, education and OEM. ACQUISITION & VIEWER SOFTWARE for Windows is included for FREE! Supports latest Windows 10 with fully automated driver installation of Microsoft WHQL certified drivers. Drivers for older Windows versions like 8.x / 7 / Vista / XP are also available. National Instruments LabVIEW support: LabVIEW drivers, well-commented GUI applications and examples are included free of charge. Compatible with all LabVIEW versions since v8.6. Future OS support is added immediately: As soon as FTDI releases new drivers they can be immediately downloaded from FTDI free of charge and can be used for the device. Unlike other companies, ALPHALAS does not customize FTDI's VID and PID and therefore the device can directly use the original constantly updated drivers as soon as they are released. This is also ideal for OEM applications. Future-Proof Concept: Compatible with latest Windows and latest LabVIEW versions. Interfacing from other operating systems and programming languages is also possible. Our Acquisition & Viewer Software for Windows is included for FREE! No LabVIEW license required to run the software. Windows will automatically recognize and install the correct certified USB driver. There is no need for manual USB driver installations. The device includes free LabVIEW drivers & applications compatible with ALL versions of LabVIEW since v8.6. If you are a LabVIEW developer simply copy the contents of the included LabVIEW drivers & applications folder (from your product CD) into your LabVIEW's instr.lib folder. Launch LabVIEW, open the included LabVIEW project and enjoy all ready to use applications or modify them as required to suit your needs. 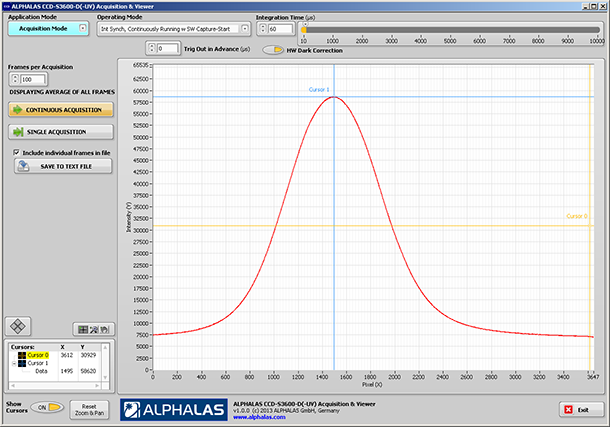 Application Example: Record of the Time Evolution of a Fabry-Perot Interference Pattern of a Single-Frequency Pulsed Laser (visualized in a LabVIEW 3D-Plot). Please find the full application example in the PDF documents listed above. Multiple fully-functional LabVIEW GUI application VIs with well-commented block diagrams, front panels and context help are included free of charge. Modern project-style, plug & play LabVIEW drivers are included free of charge. They are very easy to use and automatically recognize the connected CCD device and use the correct device properties during operation. The drivers have been developed according to the National Instruments driver guidelines. C++ examples with well-commented source code are included free of charge. A Microsoft Visual C++ project for Windows (also compatible with VC++ Express) as well as GCC C++ files for Linux, Mac OS X, etc. are demonstrating cross-platform access to the CCD line camera through a simple console application. Device interfacing from other programming languages is also possible. The user may modify and adapt all included applications and examples to suit his needs. We have created a CCD-S3600-D(-UV) data dashboard compatible with the National Instruments Data Dashboard 2.0 for LabVIEW iPad app. The dashboard can be used to additionally monitor raw or processed CCD data (as acquired and processed in LabVIEW) on a remote iPad tablet (requires iOS 5 or higher). We have included the dashboard for FREE with our CCD-S3600-D and CCD-S3600-D-UV line scan cameras. The dashboard app can be downloaded for FREE directly from Apple's App Store. The user may modify and adapt all included LabVIEW applications and examples as well as the included dashboard to suit his needs. LabVIEW is a trademark of National Instruments Corporation. iPad is a trademark of Apple Inc. Please note: Apple's iPad and National Instruments LabVIEW are not included with our CCD cameras.